CLUE: The key to unlocking the puzzle is identifying Samuel, Louis and Ludwik. There are links between them! As soon as I saw the clue and, given we were dealing with some kind of encoding here, I immediately thought ‘Samuel Morse’ and ‘Louis Braille’, although ‘Ludwik’ didn’t immediately ring any bells. Thanks to the unusual spelling though, it was fairly easy to search the intarwebs and come across LL Zamenhof (or ‘Ludwik’ to his friends), inventor of the Esperanto, the constructed language. ..and Ludwik [Zamenhof] translated what Tim said..
…then what did Tim say? Then it seems pretty nailed on that we’re looking at an original message [by Tim], which has been translated into Esperanto [by Ludwik], then the Esperanto re-written in Braille [by Louis] and, finally, the Braille transcribed to Morse Code [by Samuel]. Initially, as the cheeky montage below shows, I started trying to work this out using good ol’ pencil and paper. However, as I worked through my first ideas and returned only gibberish, I soon realised that, even if my Morse > Braille > Esperanto > English theory was correct, there were several ways to ‘interpret’ the decoding. So I decided to switch to using Python, which would allow me to run my various theories for decoding the message a lot quicker than drawing a million ‘dominoes’ on the back of a crossword! For the sake of plot continuity, we’ll assume that the pencil and paper stuff never happened, we’ll go back to the beginning and I’ll walk you through how I cracked the code using Python. DISCLAIMER: I’m only an ‘occasional tinkerer’ when it comes to coding, so this code is doubtless hopelessy clunky and non-Pythonesque. However, one of the great things about Python is that it allows you to hack away clumsily and iterate through a problem til you end up with something that ‘does the job’—clunky though it may well be. ANOTHER SPOILERY DISCLAIMER THING: I had to try a few permutations before I solved this puzzle. So I’m going to record the entire process here, including where I went wrong, as old Mr. ‘Stinker’ Stinson our maths teacher would have hauled us up out of our chairs by the sideboards, if we failed to show ‘our working out’. The first step was to get the coded message into Python. 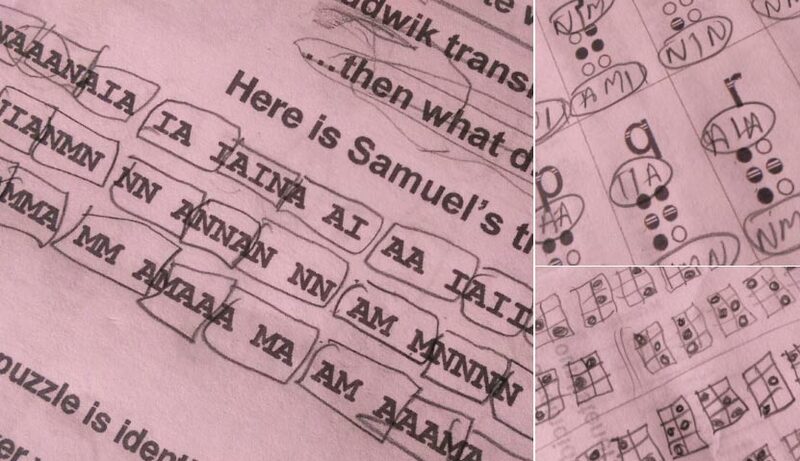 As the Beeb only supplies the puzzle as an image, this meant transcribing it. And, as I was using my Android tablet at the time, this meant transcribing it v-e-e-r-y slowly. The astute reader will be wondering why I broke the message up into equal sized groups of letters, when transcribing it into Python. This was because [at this stage] I thought the spaces in the coded message might be gaps through which Red Herrings swam, so decided to ignore them. Said reader may also be following up this thought with musings into the seemingly arbitrary decision to make each group three letters long. Now, pin that on a braincell for a moment, while we take a look at Braille. Looking at my translation of the letters used in the message into Morse Code, one thing is quite striking: Although Morse Code contains letters which are represented by 2, 3 or 4 dots & dashes, all of the letters used in the coded message [A,I,M,N] encode to Morse using only two characters. Are you thinking what I was at this stage? #could represent a Braille letter! Again, the astute reader will have realised that the above doesn’t actually represent a real Braille letter but, as I said before, I’m providing the ‘warts and all’ version here. So this was the theory I was working on at that stage. Having loaded the basic info into Python, it was time to get up to the elbows in some code and see what we could come up with. The Python code is pretty simple. The programme has crashed and burned with a ValueError because the six digit Braille code ‘111001’ we’ve created by joining three Morse letters together does not correspond to any of the six-digit codes representing Braille letters, we’ve got in the braille list. That’s a pretty disappointing start but maybe I just transcribed a letter or digit wrong somewhere, when typing in the various lists —especially as I was using a crappy touch keyboard to do so. It’s too early to throw the baby out with the bathwater yet. Let’s build in a bit of error-handling so the wheels don’t fall off, if we try to look up a non-existent Braille letter. Hmmm… Well, at least we didn’t crash this time, but the output isn’t very encouraging. It seems that most of our 3 Morse letters > 1 Braille letter combos don’t actually result in real Braille letters —hence the large number of question marks in the message and its general whiff of gibberish. However, I don’t give up that easy. I’m convinced that I’m on the right track. I’m just doing something wrong. I wonder if I’ve messed up when converting Morse to a series of ones and zeroes? I represented the dots with one and the dashes with zero. Maybe it’s the other way round? Light the blue touch paper and…. Blimey! —that was even worse! Hardly any of that lot converted into legitimate Braille letters at all. I’m still convinced the basic concept is sound, so what can the problem be? I briefly toy with the idea of trying various permutations which use the opposite encoding for the Braille letters [ie. 1 representing a space and 0 representing a raised bump], but that seems highly unlikely. 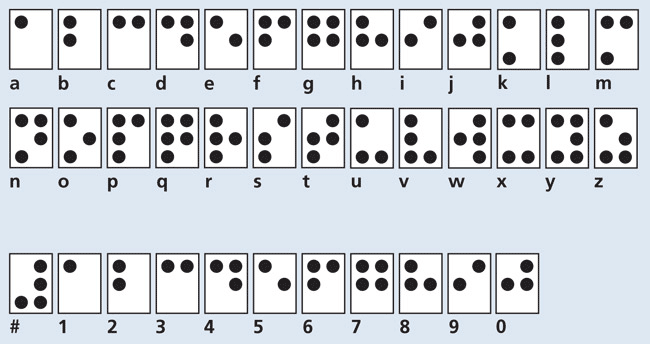 Unlike Morse Code, where you have two distinct ‘bits’ [dot & dash] and could theoretically decide to represent either as a 1 or 0, with Braille, you only have dots and ‘absence of dots’ It seems highly unlikely you’d encode for the spaces, rather than the bumps! …I notice something which has completely passed me by, up until now. Look carefully at the lines in the message. Each one follows the same pattern of letters and spaces. I suddenly realise that [not for the first time in my life] I’ve over-complicated things by trying to be too clever. Instead of reading the message left to right and grouping each set of three letters together to work from, I’ve already got all the sets of three letters staring me in the face, if I just read the message from top to bottom! Duh! –why not try reading letter triplets top to bottom? Looking good! There are a lot of groups of blank spaces in the list but I’m thinking [hoping!] these will turn out to be the spaces between words. We’ll handle those later. #yes. I know this is a bit clunky but it doesn't need importing regex module! Fingers crossed. Here we go…. CAUTION: From this point forward lie spoilers. If you don’t want to know the result, please look away now! Get bloody well in! That looks pretty much like Esperanto to me! An oddly anti-Orwellian sentiment from an organisation which spends a lot of its time keeping a beady eye on the very people in society whose thoughts do divert from the Government’s accepted worldview. Well, anyway, as you can see, after a couple of false starts, I got there in the end. I hope you enjoyed the walk-through! …and if you want to cast a mocking eye over the code used in its entirety, you can find it in this snippet on Bitbucket.